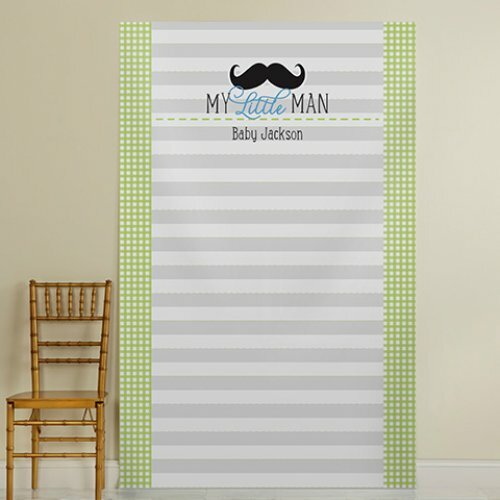 Little Man Baby Shower Theme is a good option for mothers expecting a baby boy. 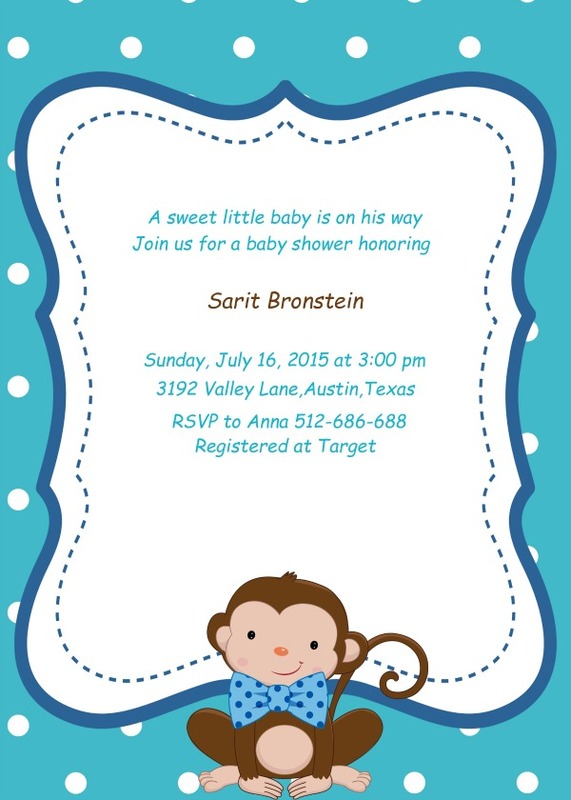 Perhaps, you are planning to organize a baby shower for your sister or closest friend expecting a baby boy. In that case, this particular theme can also make a good option. Why? It is not just because of the fact that it is always a hit among guests. 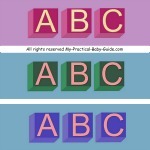 It is also easy to do allowing you to finish the task in no time at all. 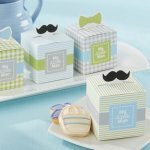 But if you are just starting, then here are some ideas you can use to organize your own Little Man Baby Shower Theme. First on the list is the invitation. The key concept you need to apply here is to find invitation cards that feature bow ties or mustache designs. To make things more personal for the mother, the baby and guests, why not customize your own design for the invitation card? 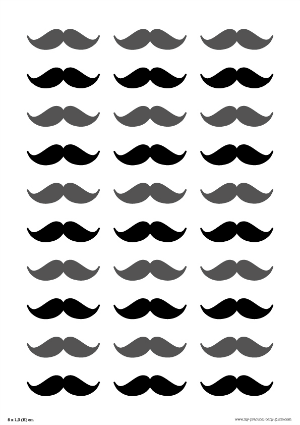 Just search for nice bow ties and mustache photos, decide on a nice background for the card and let your creativity do its magic! 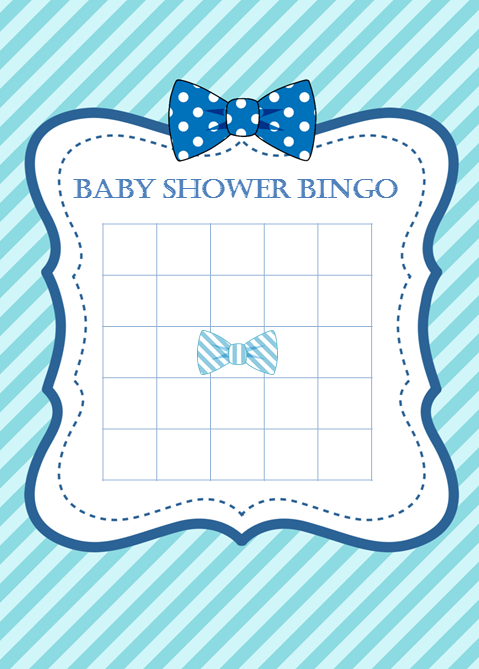 To make things more fun, include a bow tie with the invitation for the guests to wear on the baby shower! 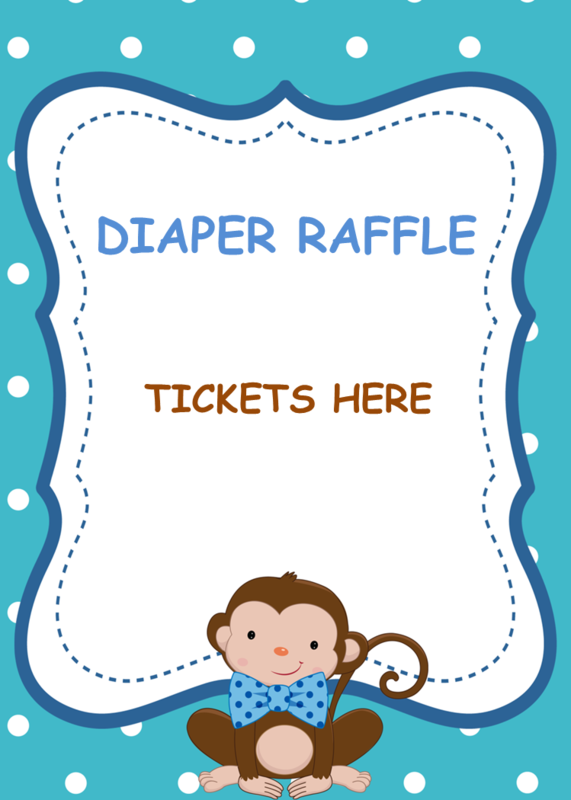 Here is an example of a Monkey Little Man Baby Shower Invitation that you can find on our Etsy Shop. It is a personalized invitation, comes in two sizes 4"x6" and 5"x7". Perfect if your color scheme is blue, white and light blue. Below and especially for our visitors we have created a coupon so come on and grab it. For the games and activities, you have the option to create your own version of onesie making station. Don’t forget to purchase the supplies or materials to use in making the onesies, including the paintbrushes, stencils and white onesies. 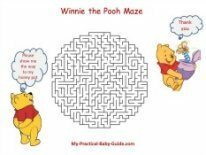 Just print the instructions for this activity so you can simply hand them with it if you prefer. 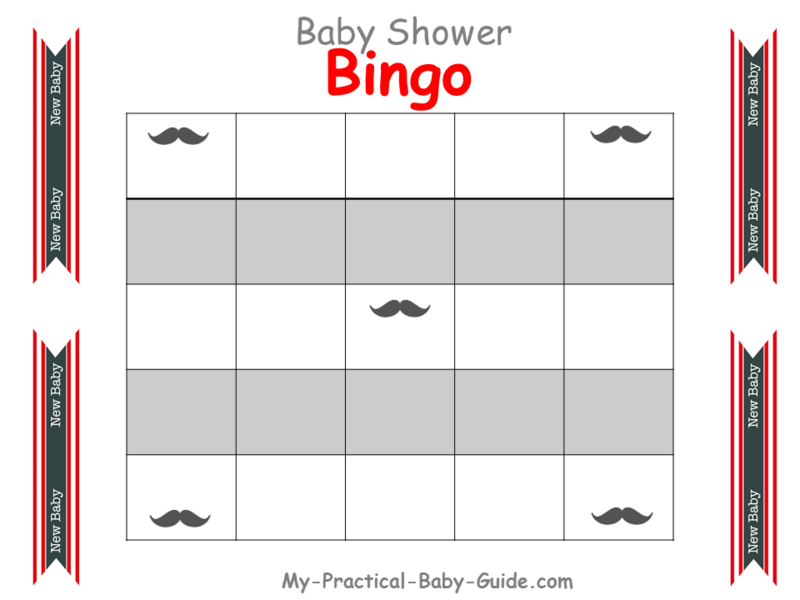 You can also add “Put the Mustache on the Baby” game on the activities. Remember the game Pin the Safety Pin on the Baby”? The same mechanics apply. The only difference is the players are going to pin a mustache instead of a safety pin. If you are looking for Little Man Baby Shower Bows Baby Shower games head over to our Etsy shop. 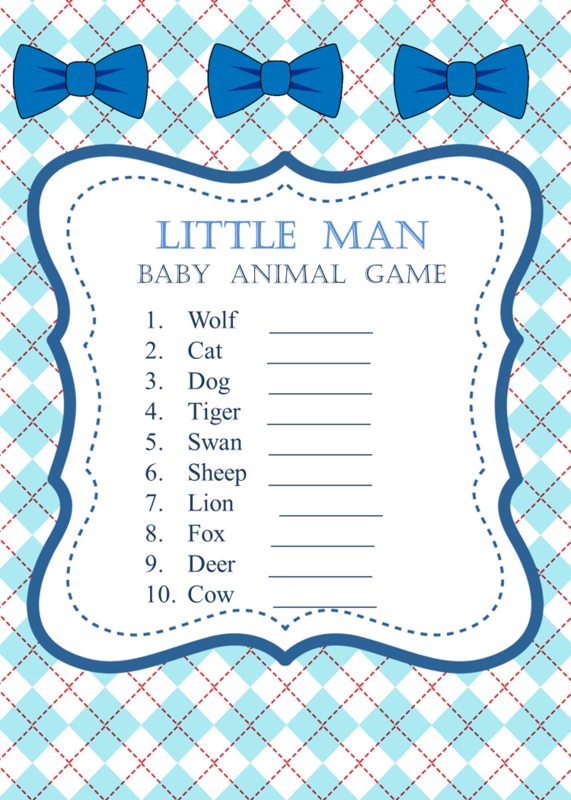 Here are some printable baby shower games made especially for the little man mustache baby shower. You can use them freely. 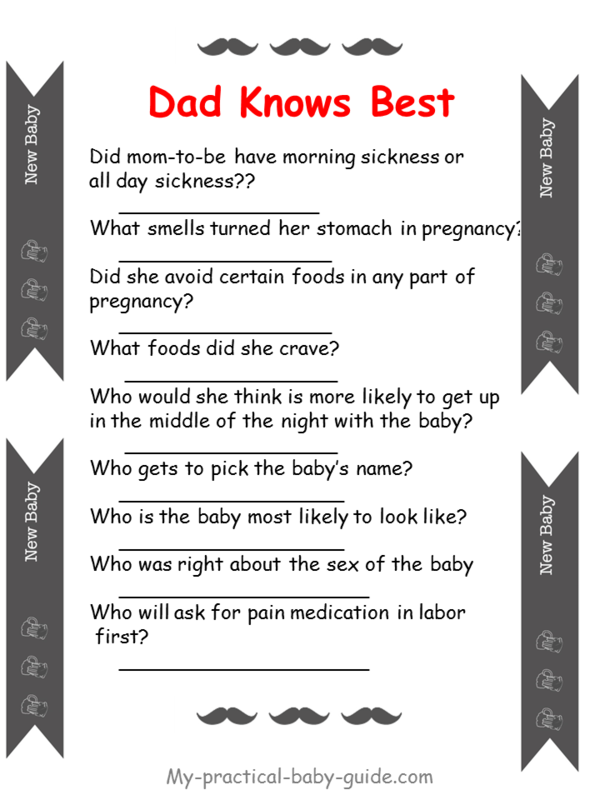 Before the baby shower, the hostess will ask the dad a series of questions about himself. At the baby shower we will find out who knows daddy the best. 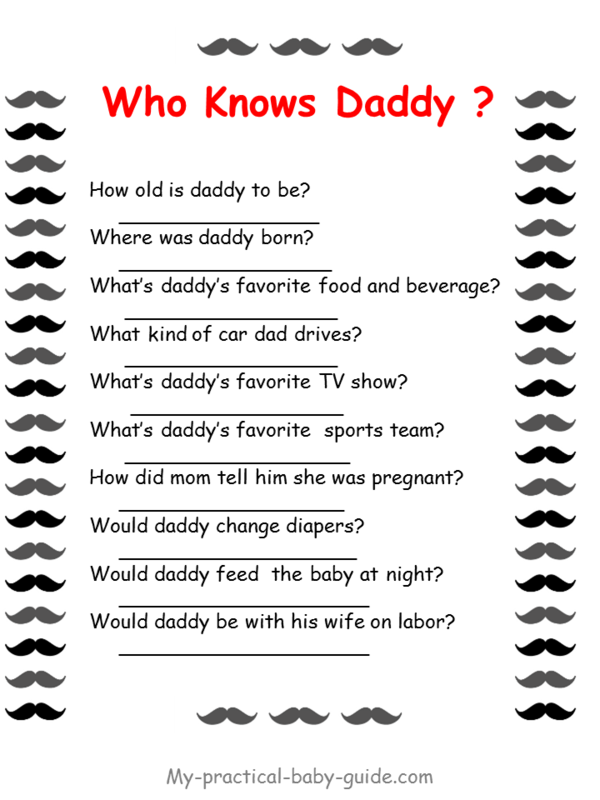 Give your guests a list of questions about daddy to be and ask them to answer them. 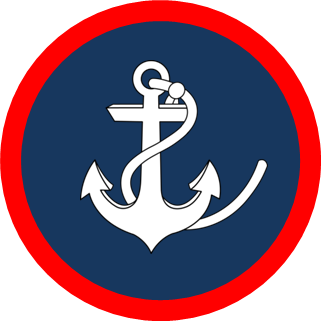 The guest who answers most of the correct answers will win a prize. It is about time dad to be is going to open a lot of gifts! This game is meant to be funny and a bit silly. 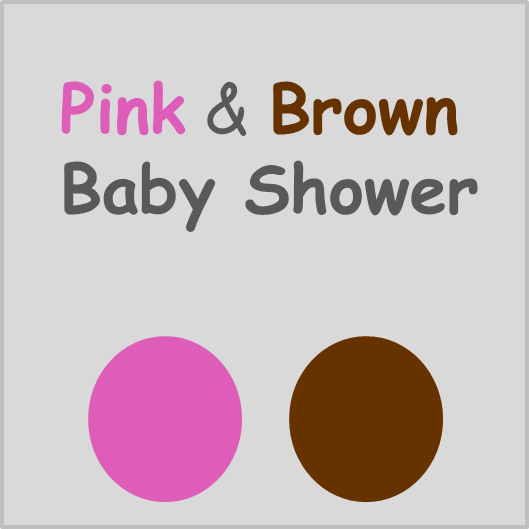 Before the baby shower, the hostess will ask the dad a series of questions about the pregnancy, birth and baby. When it came time to start the baby shower games, the questions were then the same exact questions were asked of the mother. Pass this game to your guests without the answers, let them guess what his answers were to the questions. Then you have the mom answer and then read the dad’s answers. The winner is the person who had the most number of right answers. The most exciting part is the foods to prepare. 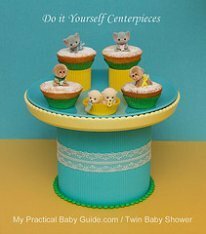 In truth, you can prepare any dessert for this baby shower theme. Just don’t forget to dress the treats with Little Man toppers, mustache or bow ties. If you want to prepare bite sized foods, just choose to serve cupcakes topped with mustaches or bow ties. Some other foods and drinks you can serve are mustache cake pops, chocolate chip cookies, strawberry and chocolate mousse shooters, Sweet Tea and Lemonade. 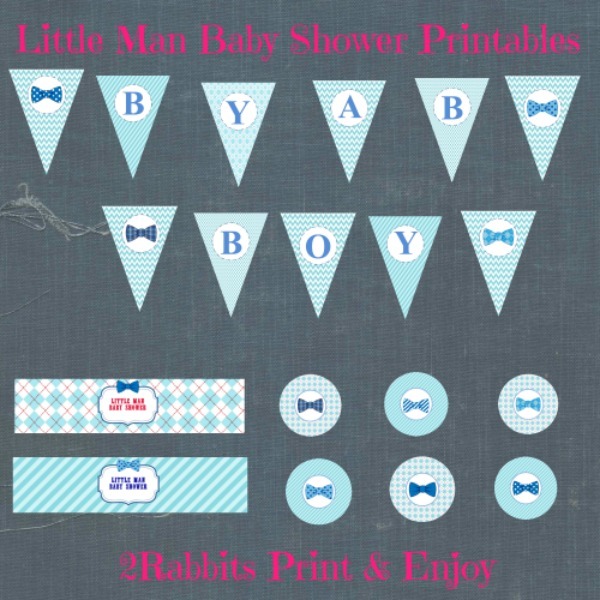 Head over to our Etsy Shop and find a Little Man Baby Shower decoration kit. 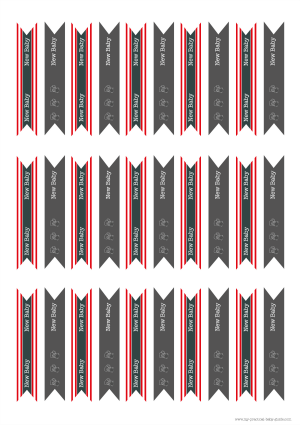 This Kit includes bunting flags,cupcake toppers and bottle labels. 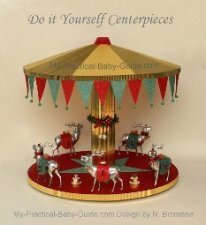 Don't forget to say that you came from My Practical Baby Guide and use this coupon. Next is on decorating the party! Of course, you will want to decorate the venue with balloons. But, not just the usual balloons used in baby shower parties. These balloons must be designed with mustaches to keep it align with the theme. 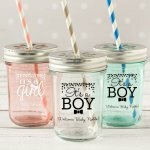 For the motif, choose from light blue, lime green, gray or other nice light colors for baby shower for mothers expecting a baby boy. You can also combine these if you want. 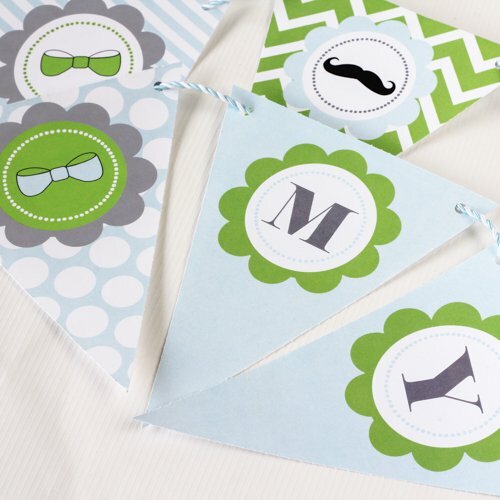 Print papers with a “Little Man phrase to stick on every item to be used as decorations. 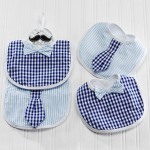 Of course, don’t forget to decorate the house with mustaches and hang onesies designed with bowties! 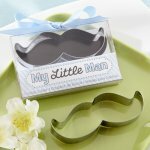 We have designed Dad's Baby Shower table decorations for your personal use such as flags, cupcake wrappers, food labels and mustaches. 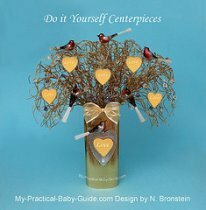 As for the favors, this is the part where you have to search your area for all possible items to use in making the favors. 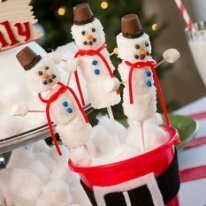 Although there are now packages you can purchase, it is still best to personalize the favors. A good example to give your guests for keepsake is an old briefcase filled with lots of knick knacks. 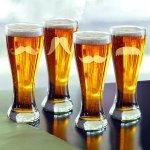 Among the items you can include are cute bottle with tags, candle, stem-less wine glass with mustache design and any others you prefer! 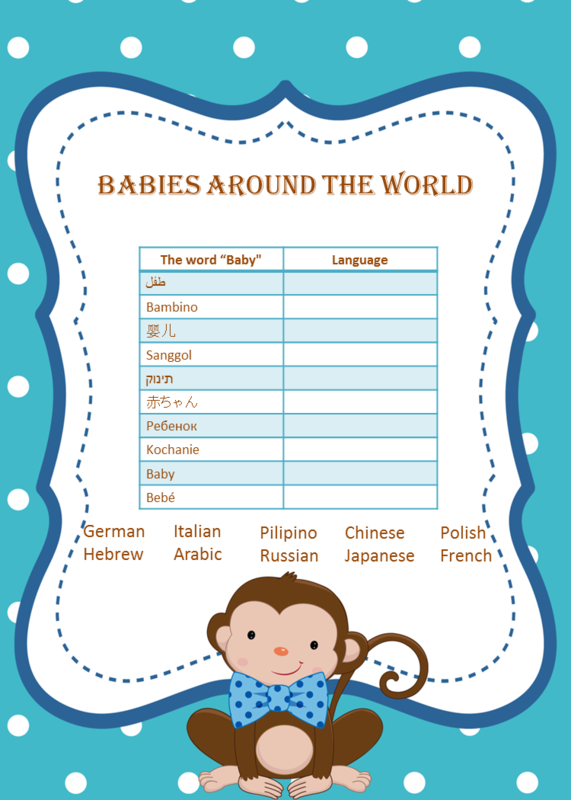 For gifts for baby, prepare a children’s book where guests can sign. Ask the guests to write down about their dreams and hopes for the baby. Of course, they should also sign lines that are aligned with the theme. Another nice gift to prepare is a beautifully-knitted and soft blanket. It is a practical gift that serves people as well.